China is the new land of opportunity. The world’s leading emerging economy accounts for 15% of global GDP and up to 40% of global economic growth. Shanghai is its tech startup hub and a global financial center. For internationals, access to the Chinese jobs market can be tricky. The 18-month, full-time MBA program at the Shanghai-based China Europe International Business School (CEIBS) – ranked number one in Asia by Forbes and the Financial Times – provides the perfect platform for international MBAs looking to pursue careers in China. In 2016, 100% of the international MBA students at CEIBS who received job offers stayed in Asia after graduation. 70% remained in China. Over half of all CEIBS MBA students secured jobs in Shanghai. CEIBS boasts a network of 19,000 alumni worldwide. Over 800 of them are internationals – some of whom have zero Mandarin skills – now based in Shanghai. Officially launched as a home for English-speaking CEIBS alumni in November 2016, the CEIBS Alumni International Chapter Shanghai supports international MBA grads starting a new career in the city - connecting MBA grads with employers, mentors, business partners, and potential investors. To date, the chapter has held over 10 different events, attracting up to 200 attendees. BusinessBecause caught up with two of the chapter’s founding members – Vijay Nadipineni and Margaret Kan – to find out more. Vijay chose CEIBS over business schools in the UK and his native India for his MBA. After graduation, he landed a job at a CEIBS alumni-owned company in Shanghai, transitioning from hospitality into commercial real estate. His latest role was as the firm’s general manager. On choosing CEIBS… I happened to come across CEIBS at an MBA fair in London. As I come from India with work and life experience in East Africa and the UK, China as a location would add to my global exposure. More important, was the global acclamation of CEIBS and the ranking of CEIBS as Asia’s top business school. On his post-MBA career in Shanghai… Without an MBA from CEIBS, I certainly would not have been able to have a career in Shanghai. With an unparalleled brand value and extensive alumni resources within China, CEIBS provides targeted career services for international students. In my case, my first job in Shanghai was at a CEIBS alumni-owned global real estate company where the interview was facilitated by CEIBS career services. Even more than potential career progression, I value the rich and diverse exposure, academic learning, personal reflection and the entrepreneurial spirit that I have picked up at CEIBS. On the international alumni chapter… It’s a unique platform that works as a direct communication tool attending to the privileged information and resource needs of all the international alumni with a China connection and the Chinese alumni with an international connection. For MBAs looking to pursue careers in Shanghai, I recommend social networking, stacking up on social skills, and learning the Chinese language – that can an always add to career prospects in China. After several years working in Toronto, Canada, Margaret relocated to China for her a global MBA experience at CEIBS. After an international exchange in Barcelona, she took up a role as an external consultant for Spanish luxury firm Puig. For the past five years, she’s been working in the luxury and fashion industry in Shanghai, developing international brands like Prada in China. Now, she’s starting her own business. As an overseas Chinese, and having spent much of her professional career in Shanghai, she feels a duty to work as a bridge to the Chinese market. On choosing CEIBS… I wanted to further my education in business and experience living in a different country. A friend recommended CEIBS to me. It was quite an obvious choice as CEIBS is a top international business school in China with excellent connections in Europe. I came to Shanghai for three days to check it out and fell in love with the city. On her post-MBA career in Shanghai… Graduating from CEIBS was definitely a turning point for my career. CEIBS has opened a lot of doors for me. During my exchange to IESE in Barcelona, I came into contact with Puig, a third-generation family business in fragrance and fashion. It eventually brought me into the world of fragrance, which I love very much. I worked for this company in Shanghai and I’m now starting my own fragrance business. I’ve been living in China for almost 10 years now and I have seen the transformation of the economy, the people, and the cities – it’s been amazing to witness. On the international alumni chapter… Our goal is to provide a home base for all English-speaking CEIBS alumni. 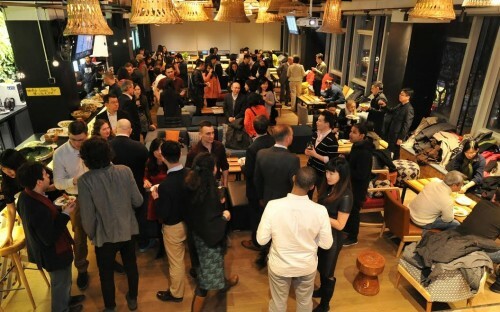 Through organizing lectures, networking events, and interactions online, we are connecting Chinese and international alumni from different programs and different years together. Now, CEIBS MBA grads can easily reach out to fellow alumni for professional advice. The connection is more organic and human compared to simply a search in the alumni database.